Hmmm, what can I say about this? Installation isn't a problem if you've done it before (DUH?!?). The board has 7 mounting holes that you can use to secure the thing. This board's design is for it to be jumperless, but alas, what's up with that? Well, most of the jumpers on the board are for things that people rarely use (true for me anyway) like Wake-on-Keyboard, etc. The one you're most likely to use a lot is the Bios reset jumper which is placed conveniently in front of the board beside the battery and not in some funky, hard-to-reach place like that of the MSI 6309. Then again, you could just press the "Insert" key during bootup to run the Bios with the default CPU settings just in case you screw up trying to overclock. Definitely a nice touch. The terminal is intuitive but may make routing cables harder. 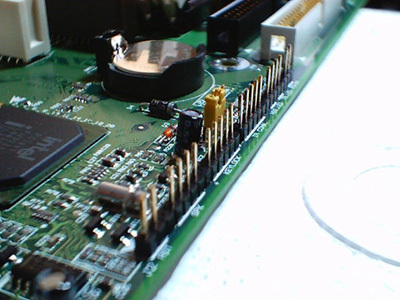 The yellow jumper behind the terminal is for Bios reset. The terminal for the case headers is easier to make out than most boards, but it really doesn't do well if you're trying to route your cables neatly. This forces you to spread the cables in a wide configuration and will look nasty once all are connected. Fortunately, some guy invented twisty or zip ties to help reduce the clutter. The manual is nicely done and will take you through the paces of installation without a hiccup. All the debug codes for the onboard debugger are nicely detailed.